Économisez 20% sur votre réservation de mars! Appelle maintenant! Près de Rocky Top Sports World! Vraiment béni vous fera vous sentir vraiment béni. Détendez-vous sur le pont avec une tasse de café du matin et profitez de la nature environnante ou assoyez-vous simplement dans le bain à remous et profitez d'un dîner sur le pont, dans l'air frais de la montagne! Visitez notre site personnel à l'adresse Hemlockhillscabinrentals. com pour cette cabine ainsi que nos autres cabines et notre contrat de location. 3 chambres décorées avec goût, 1 à chaque niveau pour assurer une intimité maximale. La chambre à l'étage dispose d'un jacuzzi romantique pour 2 personnes et d'un lit king-size construit sur mesure. Salle de jeux avec table de billard, air hockey et Xbox. Cuisine entièrement équipée pour préparer vos repas. Cette cabine a tout ce dont vous avez besoin pour rendre votre visite magique! Vous pouvez ne pas vouloir partir du tout! Mais si vous le faites, vous ne serez qu'à quelques minutes des restaurants et des divertissements de toutes sortes à la fois à Gatlinburg et à Pigeon Forge. Juste environ 3 miles de la promenade principale du centre-ville de Gatlinburg. 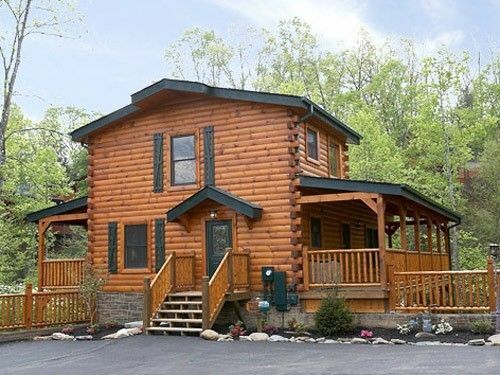 This community of cabins is very close to gatlinburg. We loved all the space our family of 6 had to spread out in... especially the basement! Not very happy with deception of where this cabin is located. This is not the same property that was shown on the VRBO map. The property was supposed to be on Loop Rd and we stayed off Proffit Rd. Very disappointing that we were mislead on location of our stay. Even our directions did not list the actual address of the cabin. The picture shown above is not the same cabin we stayed at; if so, then please update your pictures. There are two large trees in front of this property...too much deception. Overall the cabin was clean and decorated very nice. However, the two pullout beds were very uncomfortable and the TVs in the bedrooms were all small 19" TV. I am so sorry you feel this way. This property we have had on VRBO for many years now and have never had any issues or questions like this. We give the address to VRBO and they provide the map, so we have no idea why they placed it on the map like they did. We have double, triple checked and the address is correct. However, it has been correct for many years so we do not know what happened here....The pictures of this cabin are accurate, we actually built this cabin and took the pictures ourself. I assure you these pictures are the actual cabin photos. I am not sure if you may have thought you were reserving a different cabin at time of booking because I know some people look at many different properties. Year Round Special - Stay 6 Nights, Pay for 5!